I remember the Tony the Tiger commercials from when I was a kid, but didn't realize he was still the spokes-tiger for Frosted Flakes until we received a box from Kellogg's recently. 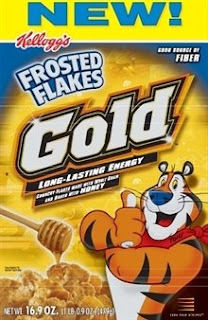 Frosted Flakes Gold are very crunchy and have a definite honey-taste to the flakes. They were a big hit with my kids -- the box was empty in just a couple days. I found it a little amusing that the boys were both impressed with the verbiage on the box stating that it would give them "long-lasting energy." One word that I often use to describe N is "energetic," and he was all about a cereal that would give him even more energy. We took some time to talk about how foods give us energy and were able to create a nice little lesson around it. Kellogg's has created a site with lots of information about healthy eating, exercise and ideas to stay active. They've partnered with ESPN for a contest and also have freebies and fun downloads on their site www.frostedflakes.com. Thanks again to Kellogg's and Mom Central for the opportunity to try this new cereal!